In writing about the abundance of singularities (tipping points) in my previous post (here) it became apparent to me that in literature both great faction (my word for non-fiction) and great fiction document either slavery, servitas, or freedom, libertas. What is significant here is my education in literature never described it this way. Simply put, the difference is between the two is whether you follow through or not. Do you make the transition from the old order to the new order or do you fall back into the old order. 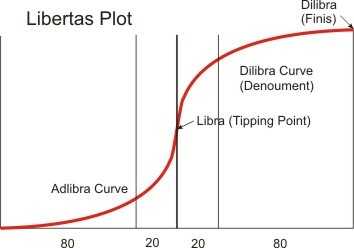 And the libertas plot reveals you can fall back not only before the libra point (the breakthrough), but before the dilibra point (the finish) where you achieve dominance. 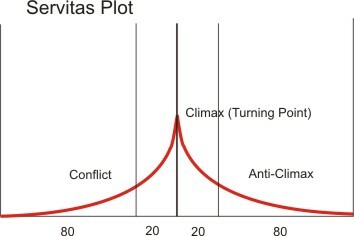 The libertas plot illustrates the transition from old plurality to singularity to new pluralarity. As John F. Kennedy illustrated in his “We choose to go to the Moon” speech, reaching the Moon was the breakthrough, returning safely was the finish. In the same way we must choose to not only cross the singularity of creating artificial intelligence, but also include the plan to shut it down safely. When we look at history, winning a war is a breakthrough, restoring order (lasting peace) is the real finish. The Soviet Union’s defeat in Afghanistan was a crucial anti-climax in world history that exhausted the Soviet Military, Soviet Imperial aspirations and ultimately averted a third world war in the 20th century.